March 2009 ~ I Can Do That! There are so many choices of baking pans with all sorts of shapes and designs in the baking aisles at chain stores and discount kitchen shops. Last year I got a coated metal with 2-inch squares and a silicone with 1-inch squares. I use them for single serve brownies and cakes. Baking the brownies in these pans eliminates the step of cutting it into squares. They are easier to store and serve, and I like it for portion control. Isn't that cool? The flexible silicone is more versatile as it can be used for the cutest mini-cakes and to freeze embedded liquids to decorate drinks, or for freezing lemon juice or stock. Hip To Be Square is this week's Lasang Pinoy Sundays, a weekly food photography meme, hosted by SpiCes. I'm new to Indian food. It's only recently that I started liking this highly seasoned cuisine. I finally got an Indian cookbook after making and loving Chicken Kerala a few months ago. The Lamb Biryani in the book appealed to me right away but I substituted seitan for the lamb because I wanted a meatless dish. I made seitan by mixing vital wheat gluten with water, then cooking the cubed/sliced seitan in water seasoned with soy sauce and chopped onion. For the vegetables I steamed green beans, carrots (purple and regular orange), and skinned baby lima beans. This dish is very yummy and healthy too. Mix the lamb cubes in a bowl with the ginger, garlic, garam masala, chilli powder, turmeric, green chilli, coriander, mint, and salt. Cover and refrigerate overnight. Wash the rice in a sieve under cold, running water until the water runs clear. Set aside. Put the sliced onion in a sieve, sprinkle with the salt and leave for 10 minutes to drain of any liquid that oozes out. Rinse and pat dry. Heat oil and butter in a large saucepan, add the onion and fry for about 10 minutes or until golden brown. Drain onions, reserve the oil and butter. Transfer the lamb and marinade into a casserole and add the browned onion, 2 tablespoons of the reserved oil and butter, and the yogurt, and cook on low heat, covered, for 40 minutes, or until lamb is tender. In a separate saucepan, boil enough water to cover rice. Add the rice to the pan. Return the water to the boil, cook the rice for 5 minutes, then drain well and transfer into a bowl. Mix in 2 tablespoons of the oil and butter, the lemon juice, and a little salt and gently mix. Spread the rice evenly over the meat. Spoon the saffron milk over the rice. Cover tightly with foil and bake for 40 minutes. Serve topped with salted steamed vegetables. Garam Masala means "warming spice mix". It can be a mixture of whole or ground spices. Recipes are numerous but they are all aromatic, rather than "hot" mixes. Remove the seeds from the cardamom pods. Put all the ingredients in a spice grinder or coffee grinder and grind to a fine powder. Store into a small airtight container until needed. There's an abundance of assorted citrus fruits at Costco and I couldn't resist their bright sunny spring colors. I haven't stopped buying Cara Cara oranges, got a large bag each of limes and Meyer lemons, and one humongous bag of Jaffa Sweeties, a cross of pomelo and white grapefruit. They are soooo deliciously sweet I want to eat them all day long everyday, the whole year round if possible. These citrus fruits are developed in Israel and just like Cara Cara this is the first time I heard of them. To my dismay when I went back to get another bag they were all gone after only a week in the store. I have so much limes and lemons there isn't space in the refrigerator to store them. I froze some of the juice in a Wilton silicone baking mold with 1-inch squares for tiny cakes or brownies. Each square holds exactly 1 tablespoon of liquid, perfect for freezing citrus juices for later use. I made some into lime curd and lemon curd, both are utterly yummy, sweet and slightly tart. Next week, I will be busy baking lemon, lime, or calamansi pound cakes. Put butter, sugar, juice, and zest into a glass bowl set over a saucepan of simmering water. Let butter melt, then gradually whisk in the beaten eggs. Cook, stirring constantly, until thickened to the consistency of instant pudding, about 15 minutes. Remove from heat, wipe bottom of bowl, and cool for a few minutes. Transfer the curd into a clean jar, cool completely, cover jar, and store in the refrigerator. We have been buying soymilk since forever and only recently noticed that most brands have additives such as sugar to mask the "beany" flavor and xanthan gum or carageenan for a creamier texture. Making soymilk was never in my must-make list until I saw and clicked on an ad for soymilk maker. I didn't know these makers are available for soymilk enthusiasts. 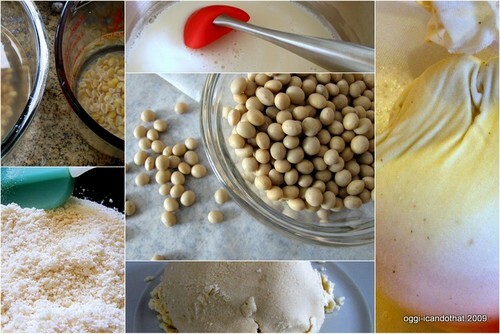 Searching online for making soy milk without a machine, I found a lot of websites including Martha Stewart teaching how to make soymilk at home. I happen to have a 32-ounce bag of soy beans sitting in the pantry, I can't remember why I bought it. Maybe it was waiting to be made into milk. After one sip of the still warm delicious plain no-sugar milk, I am convinced homemade soymilk tastes superior to the ones in cartons. The milk has the slight beany taste of silken tofu which is why I love it. I noticed that unlike the store-bought there are no grits at the bottom of my cup and in the jar. The thickness can also be adjusted to individual preference. Rinse soybeans, drain, and add water to cover 2 inches over the beans. Soak beans overnight at room temperature. The next day, drain the water, rinse twice, and drain very well. Hull the beans, if preferred. Place half of the beans with double the amount of water in the blender and blend on high for 2 minutes. Transfer into a large bowl. Remove all the foam on top with a small sieve. Repeat with the rest of the beans. Place a sieve on top of another bowl, line with the muslin. Pour the liquid through the muslin and let drip into the bowl. Gather the corners of the muslin and twist the top. Press to extract as much liquid as possible. Boil 1 cup of water in the stockpot, add the extracted liquid, add salt and sugar if using, and over high heat let the mixture come to a boil, constantly stirring and scraping the bottom. Turn down the heat to medium and simmer the milk for 25 minutes. Stir down the foam as it rises until it dies down. Transfer into a clean jar, cover, and refrigerate. In a medium bowl, beat eggs with sugar until light yellow in color. Add milk, butter, and vanilla extract, mix well. Place half of the bread cubes into a baking dish or individual ramekins. Sprinkle with half of the candied ginger, repeat with the remaining bread cubes and candied ginger. Pour the milk mixture all over, press down so that the custard covers the bread completely. Place the baking dish or ramekins in a large pan. Carefully fill the large pan with hot tap water halfway up the sides of the baking dish. Bake ramekins for 45 minutes, baking dish for 1 hour or until tops is golden brown. Gently press down the middle to check if the custard is fully cooked. Remove from oven, cool slightly before dusting with powdered sugar. The pudding is also good cold. Lasang Pinoy Sundays hosted by SpiCes is a weekly photography meme. Click on the yellow button to view more BREAD-y Or Not entries. Upcoming Concerts In Washington, D.C.
Labels: concerts, Keiko Matsui, music, Turandot, Washington D.C.
Keiko Matsui: March 22, 2009 at 3 PM as a guest performer at the US Air Force Band concert series. Free admission, details here if you live around here or will be in this area that week. TURANDOT: The Kennedy Center, May 19 - June 4, 2009. My daughter and I have been waiting for this show for almost a year now. We heard that one of the sopranos sharing the role is younger than previous performers who IMHO were too old and scary-looking rather than the beautiful ice princess that a long list of men lost their heads (literally) for. THE BAD PLUS: March 26, 2009 at the 9:30 Club in Washington, D.C. Unfortunately for us, they will be accompanied by Yoko.....I mean Wendy, so no, we're not going. They are also scheduled to perform without her on March 29, 2009 at Ramshead Tavern in Annapolis, MD but somehow I have lost my enthusiasm for TBP. I also have a bad feeling she will appear there as well. I shudder at the thought of seeing and hearing her. Meh. The beautiful bright uncluttered photographs in the KULINARYA cookbook are so inspiring I want to prepare our everyday Filipino dishes looking as clean and appealing. Many delicious Filipino dishes specially the stews are usually not photogenic with their dark sauce. One such dish is Kare-Kare, a meat stew with peanut based sauce, served with an assortment of vegetables and eaten with bagoong alamang (shrimp paste). In restaurants this very flavorful and colorful dish is served in a native terracotta pot but the presentation is somewhat ugly with the meat and vegetables all smothered in sauce. There is nothing wrong with that but I would like to see an easier on the eyes Kare-Kare dished up in a more appetizing way where you can see the contrast of greens, purples, and whites against the orange sauce. I'm glad to learn that a few notable restaurants in the Philippines are now plating better looking and appetizing Filipino dishes.